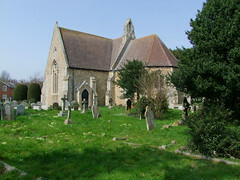 This is the church of Old Felixstowe. Until a couple of hundred years ago, this was a small church in the middle of a tiny, straggling fishing hamlet. It was an outpost of the much larger village of Walton, a couple of miles to the south. In the 1830s, Felixstowe was discovered by Ipswich's middle classes as a south-facing bathing resort. By the end of the century a massive building programme had been undertaken. Now, Felixstowe has reached out and engulfed Walton, becoming Suffolk's fourth largest town, home to not far short of 40,000 people. Walton parish church sits on the edge of Felixstowe's modern town centre, but the church that is Felixstowe's in name sits far out in the north-eastern suburbs, so that you would be most surprised to see its modern setting if you had travelled in time from then to now. Not far from here, and just across the parish boundary in Walton, stood the now submerged Roman fortification of Walton Castle. It was here in 631 that St Felix came ashore after travelling from Burgundy at the invitation of the King Sigebert and the East Anglian royal family, and established his see of Dumnoc. You can still see remains of the castle off of Old Felixstowe at very low tides - or, at least, it is easy to imagine that you can. A medieval time traveller would be even more surprised to see that this church has been almost completely rebuilt since its Catholic days, in a grand and fascinating manner. The transformation was carried out by Edwards and Roberts of Dundee in 1872. The lower part of the tower survives, the oldest structure in the parish by hundreds of years. 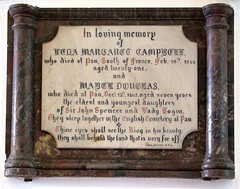 The upper part, in common with many in this part of Suffolk, succumbed to the coastal weather in the late 18th century, and is a capped twin to that at Bawdsey, two miles or so across the Deben estuary. 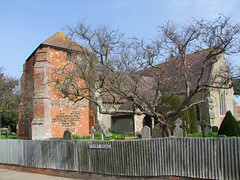 The ruinous building was patched up in an economical fashion, including the construction of the rather curious red brick chancel shown in mid-19th Century photographs. 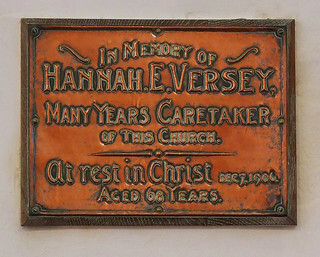 It is an odd date to build a chancel. Perhaps it was used as a school room. 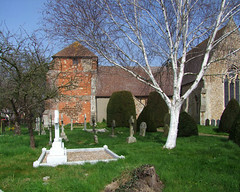 The two photographs below are taken more or less from the same spot and show the church before and after its restoration. So it was then, in the 1870s, that a substantial rebuilding took place. 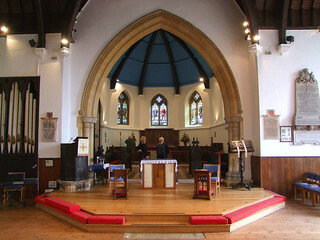 The chancel was taken down, and transepts and a new chancel added, more than doubling the length of the church. Much was retained in the superstructure of the nave, but the roof was renewed, as were all the windows. 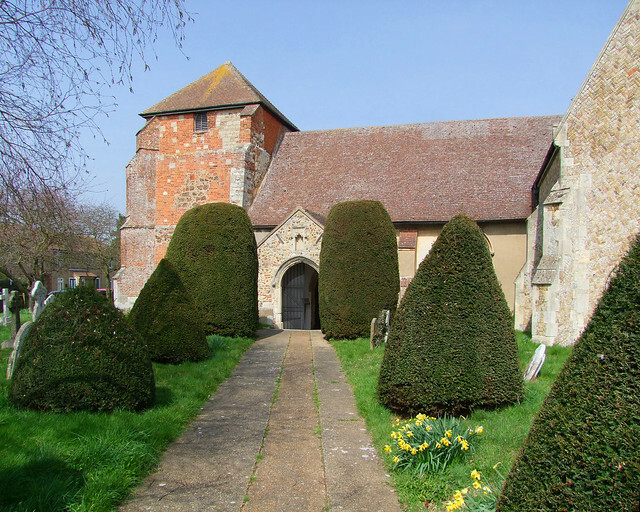 The crossing is very high, much higher than the nave, and outside on its gable sits a fine sanctus bell turret. 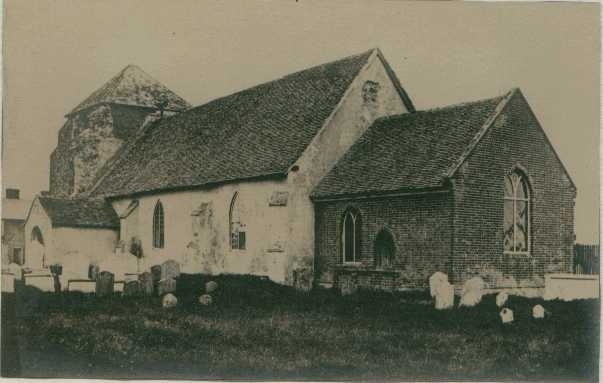 I found this intriguing, since it appears to be medieval at heart (despite now incorporating a chimney) but as you can see the photograph of the church before its restoration does not show it. I wonder where it came from. The parish war memorial is one of those grand ones designed by Henry Munro Cautley for about half a dozen churches in the Ipswich area. Even so, it doesn't feature as many names as you might expect for a port of this size. 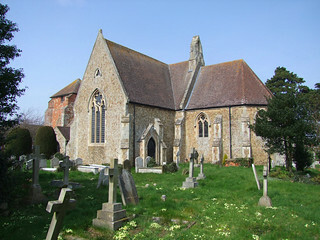 This is because by the end of the 19th Century most Felixstowe people were living in the new parish of St John the Baptist, carved out of this parish in the 1890s and served by Arthur Blomfield's magnificent red brick twilight of St John's. 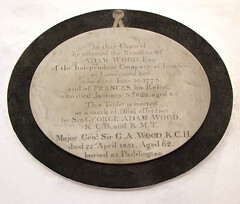 By the time of the Second World War, St Peter and St Paul parish was even smaller, the town centre end of the parish forming the new parish of St Andrew, served by Mason and Erith's remarkable concrete church of St Andrew. 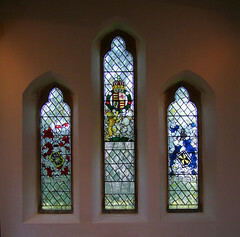 There is a George V Royal arms in glass by FC Eden in the north transept. The windows up in the apse-like sanctuary are jewel-like in this setting, but unfortunately no record survives of which workshop made them. They have something of Powell & Son about them. 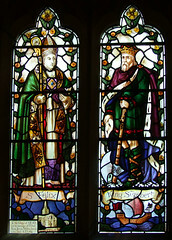 They show a combination of the East Anglian Saints Felix and Edmund, as well as that Saint associated with the sea that are so familiar in this part of Suffolk, St Nicholas. 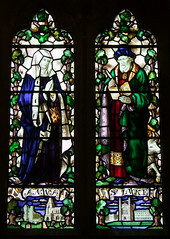 Anna stands beside St Luke with his story about her at the presentation in the temple. 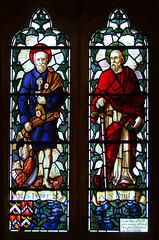 The church patrons St Peter and St Paul and King Sigebert of East Anglia complete the set. Below Felix is Norwich Cathedral, and under Edmund is Bury Abbey, neither place ever visited by them - or, at least, not while alive. 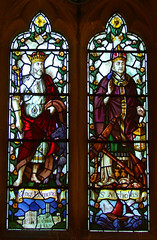 More surreally, St Luke is paired with Kings College, Cambridge, and Anna with Hadleigh Deanery and church. Presumably these are places of significance to the Cobbold family who gave the glass. 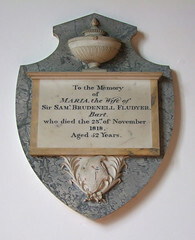 Either side of the chancel arch are two high quality memorials in shimmering alabaster to two brothers, Henry Arthur and John Hudspith Turner. In the early years of the 20th Century they were canons of Aklavik Cathedral, which sounds terribly grand. In fact, this was a tiny mission church beside Hudson Bay, 150 miles within the arctic circle, on the MacKenzie River in Canada's North Western Territories. 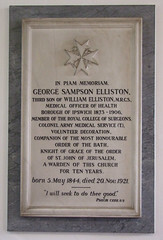 It served what was geographically the biggest Anglican diocese in the world. The little town is accessible by boat only in the summer months and across the ice at other times. Even today, Aklavik has only 600 people living in it. The mission was founded in 1916, and the church was built out of logs in 1919. The Turners arrived in Baffin Island soon after. Henry Arthur's memorial records that facing difficulties with cheerful courage he laboured with the Bible Churchmen's Missionary Society among the Eskimo of Baffin Island for 25 years where he was also Engineer, Builder, Schoolmaster and Translator of the Scriptures. The ordinand training school of the Anglican Diocese of the Arctic is called Arthur Turner College in his memory. On John's memorial it notes that he worked in the service of his Master for 18 years in Baffin Island, making long journeys from thence over frozen seas to Eskimo camps and translating the Scriptures into the native tongue. Although they were made canons of the cathedral in recognition of their missionary work, it is unlikely that they ever visited Aklavik. The Diocese is so vast that Baffin Island is as far from Aklavik as Felixstowe is from Moscow. The church burned down in 1972, and its replacement, also of log panels, remains the most northerly cathedral in the world.